Kat's 9 Lives: Gotta Have My Milk Tea! I was obsessed about this place back in the day. 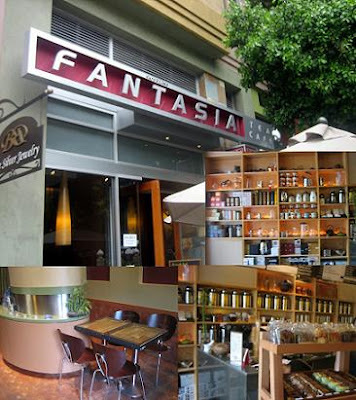 Fantasia Tea Cafe is a chain up in Northern California. I often went to the one in Cupertino right after I got my delightful Q-pop chicken. This was the first time to Santana Row near the Valley Fair Mall. The prices were luckily only a little bit more than the location in Cupertino, which was surprising since the rent in Santana Row must be extremely high. It was a very nice and clean location. Definitely a nice place to sit and lounge to people watch while you sip on your drink. If only it wasn't raining that day, it would have been nice to sit out and chat while we wait for our dinner place to open. My usual drink there is the Passion Fruit Milk Jasmine Tea. I am not a big fan of tapioca so I opted out of it. 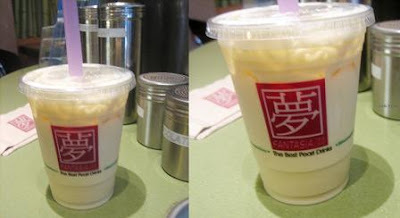 This drink has a special kick to it, the passion fruit mixed with the milk and tea always tickles my throat. Nonetheless, I still drink it because I love the smooth flavor combo. Be sure to drink it and not leave it sitting out too long because I have seen how it separates the milk into chunks. I love coming to Fantasia for a drink, it's much better than the drinks at Q-Cup. This is why I love the Cupertino location because they are only a hop skip and a jump away from each other! Finally, a Chinese operation that understands packaging!